I love e-reading. I split my reading time between my iPad and my Kindle Touch. The iPad is fabulous for graphical books, magazines and the news plus it’s the one place I can read all the book and magazine formats. The Kindle, however, is my favorite device for reading novels and “straight text” publications. It’s small, light and doesn’t change page orientation if I move in the wrong direction. My old eyes don’t handle small print well anymore so these devices have given me back the joy of reading. My problem now is finding good reads. The down-side of ebooks is ebook stores. I personally think that Barnes & Noble has the best online bookstore. It’s very welcoming and easy to find the books you want. It even does a good job of giving you a pleasant browsing experience. The problem with all of them is there’s just so many covers that will fit on the screen at any given time. It’s no where near the number of titles you can scan on a physical bookshelf. I have to admit, I go down to Barnes & Noble every weekend for coffee, a bagel and to browse the books and magazines. Unfortunately, B&N can’t stay in business for long with too many customers like me. Even if I do buy something while I’m there, it will probably be a digital edition rather than a physical one. One of the very nice things about a book store is it’s full of book people – people who enjoy reading. Most of my conversations while I’m drinking my coffee are about reading. Did you like that book? Have you read his latest book? What did you think? This is how I “find” most of the books I read. There are several very good online reading communities who provide a place for book people to get together. One advantage to these communities is their reach. Since the reading community around my local Barnes & Noble store is relatively small, I don’t have too many people seriously interested in genealogy for book conversations. The reach of an online community provides the opportunity to create topic-specific groups who can then share the books they’ve read and offer recommendations. One place I really enjoy is GoodReads. It’s a great place to connect with other readers and share reading suggestions. And, by building your library on GoodReads, the platform will offer recommendations based on your library and the ratings you gave each of your books. The group feature is delightful. I belong to a couple of genealogy groups, an English mysteries group and my local library’s group. Some groups are very active following a book club model while others are more passive – members listing the books they’ve read with their rating and maybe a review. You’ll be able to find a group – or two – that suits you. Once you’ve created your account, you can start by exploring the platform. Look for books under the Explore menu by selecting Listopia. Here you’ll find dozens of book lists ranging from this month’s best books to books to become an informed voter to a number of lists for genealogy books. It’s addictive so be careful. As you wander, you’ll find others reading the same books as you and in groups you find interesting. As in any good social community, you can make connections with them and follow their status at GoodReads. You’ll see what they’re reading and learn what they think about the books they’ve read. If you find a group that looks interesting, join it. Groups have their own book list, discussion board and even events. The English Mysteries Club is quite active with lots of general discussion and a more formal book of the month discussion. Whether you join a group or not, you should rate and review each book you include in your library. This will not only help GoodReads find other books that you would like, it will help all of the rest of us learn more about a book. You don’t need to write a formal review, but please tell us a little more than “great book”. Why did you choose to read this book in the first place and did it live up to your expectations? Did it provide the information you wanted to know? If you are an author, GoodReads has an Author Program to help authors promote their book(s) by giving them access to their target audience. It costs you nothing to participate and they offer all kinds of support to help you in your marketing efforts. GoodReads will never be the little shop around the corner, but it can be a very satisfying hangout for book lovers. You can participate at whatever level works for you. And, unlike that little shop, thanks to the GoodReads apps you can take it with you anywhere. What a great idea for zeroing in on books in such narrow interest ranges as genealogy! I’ve heard of GoodReads before, but had been thinking about it in a more universal or generic light. This sounds promising. Thanks so much, Denise, for this helpful post. It’s like you’ve been lurking in my head. I’m right in the midst of the decision on whether to go with a Kindle since I already have an iPad that I enjoy. And you’ve described pleasures of the bookstore so well. Just browsing through the shelves is fun. 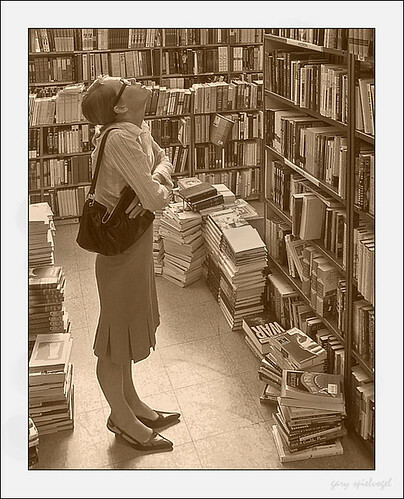 What a dilemma, so many choices of what to read…and now we have to decide how to read them. I just had to say thanks for giving me the overview of GoodReads as well. Now I’m getting busy there, too. Your blog is one of my favorites. It’s always packed with goodies! Nancy, thank you for your very kind words. I bought my original Kindle (a Touch) because everyone else in the family had Kindles except me (iPad). I wouldn’t give up my iPad for anything, but I much prefer to read books on the Kindle both because it’s easier to hold and easier on my eyes. And, because the rest of the family have Kindle’s it’s easier to share books too. Then, there’s the Personal Documents thing which I’m having great fun using to share family stories with the clan . . .